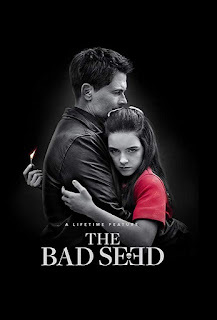 Lifetime aired a Rob Lowe directed and executive produced film called The Bad Seed, a 2018 remake of the 1956 film, where in this version, a single dad has one twisted, disconnected little daughter who likes to eliminate her problems, whether it be a pesky cat or a fellow student, or even her baby sitter. The tag line says "A father is forced to question everything he thought he knew about his daughter when he believes she may have played a role in the tragic death of a classmate at her school." The film stars Rob Lowe as the father, Mckenna Grace as Emma, the disturbed daughter, and other cast members slated to be doomed such as Patty McCormack, Sarah Dugdale, Cara Buono, and others. The film had very few scores on IMDb with a 6.2/10, but to be honest, for a TV movie, it's slightly better than that I think. We watch poor little Emma, who seems like she has a slight, OK, big dissociative disorder but no one really notices. Not until it's too late. Grace really pours it on with the dual personality of pretending to get along like a normal little girl, all the while, turning to frowns of displeasure with pretty much anyone near her. The film doesn't really set any trends or standards and at times pays homage to the original film a few times. But overall, it's entertaining enough to watch and be totally frustrated with the little evil freak that Grace is. Rob Lowe's character, her dad, well, he's in quite the pickle, not being able to decide what to do about her once he figures it all out, but you'll see what I mean. It wasn't horrible, nor was it great.